Session musicians are essentially "for hire" musicians. They perform with solo artists and bands, but they are not officially part of the group. 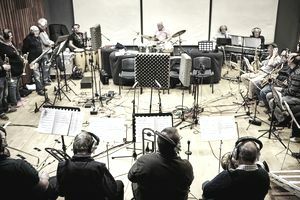 Session musicians play on recordings, play in live shows or both. Although some give and take often happens during a recording, the general understanding is that session musicians play what they are asked to play, even when they may have musical reservations about the direction. Affability in these circumstances is key. In general, session players don't write the music. They either play what others have written — the common practice in film session work — or else they improvise a performance, often with not even a chord chart to guide them. For pop, rap and soul session players, that's an essential part of the job. Sometimes the artist or producer will provide (and insist on your following) a direction. At other times, the producer and/or artist want you to come up with something on your own. Still, you have to do this with some sensitivity to the existing or intended musical direction. Where Do Session Musicians Work? Occasionally, session musicians are tied to studios and may work in a particular location — this is more common in some geographic regions than others. Most are independent contractors who find work by word of mouth — occasionally from a favorable comment by a studio engineer or, more often, from comments by producers to other producers and artists; artists may also recommend session musicians they have worked with to friends, and so on. Session musicians sometimes go out on tour as well. There was a time when labels had session musicians on the payroll as a matter of course — notably Motown and Muscle Shoals — but this is now almost unheard of. In Nashville, a somewhat different practice exists, where the studios don't hire the players, but the players tend to work with other players in specific studios. Getting work in this environment is a little different than in other regions. Most session musicians get work by word of mouth. The best way to keep steady work coming in is to work on your reputation as the go-to player for your instrument in your area and to be consistently reasonable and easy to get along with. Getting local studio engineers on your side and building a relationship with labels and, above all, producers, is essential—low-key self-promotion is critical to getting your career as a session musician off the ground. Become a busy session player can be tough for introverts — the session milieu is partly work and partly a meet-and-greet. If an easy relationship with persons you don't know is hard for you, particularly at short notice and when there are several of them at once, you'll need to work on overcoming this. Many have; it's definitely doable. The way you are paid as a session musician can depend a lot on where you live. If it isn't a union gig, then you need to negotiate a rate for the job when you're offered it — either an hourly rate or a set fee. In general, more session musicians who work in New York, Los Angeles and Nashville are paid over the union scale minimum — often double or triple scale — than musicians working elsewhere. Session musicians almost never receive royalty payments. If the gig is a union job, however, the employer must also contribute to the union's pension fund. Things can get a little complicated for a session musician if certain things aren't hashed out up front. Keep these questions in mind before you take a job. While it would be nice to get any wage agreements in writing, that rarely happens. One well-known LA session musician confided that in over 40 years of studio work, he'd never seen or even heard of a signed session wage-agreement other than the standard union contract which is always filled out by the paying party after the gig, not before. But in some ways, it's a small industry — every session musician in a given region comes to know which producers' and artists' word can be trusted and whose cannot. Of course, other issues may arise in a session, and you'll need to deal with them directly and professionally. If you make a significant contribution to a song, for instance, and believe you're entitled to a ​royalty share, make sure that an agreement is made before you leave the session.